As a writer I value my work even when others do not. 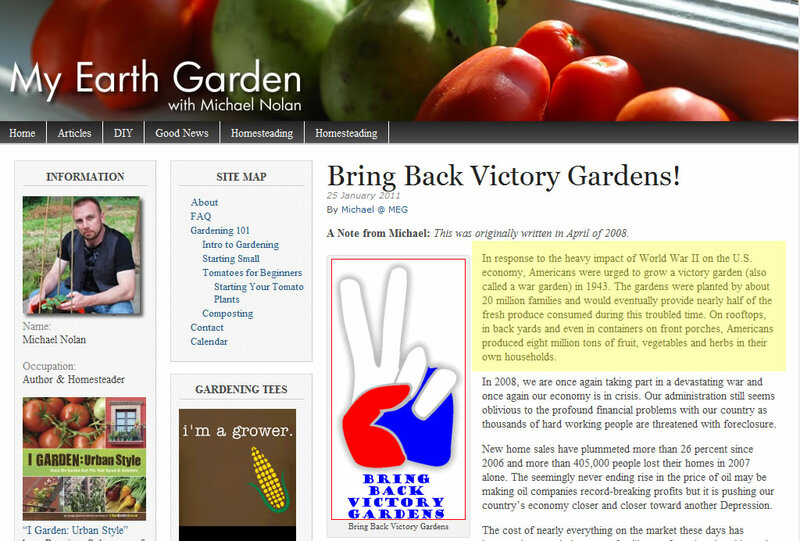 A few years ago I wrote an impassioned plea to “Bring Back Victory Gardens”. Because my website did not receive a great deal of traffic at the time (I wasn’t yet the amazing rockstar garden author that I am today) and I believed that plea worthy of more exposure, I created this page on HubPages in the hope that it would draw more attention. Little did I know until this morning that it drew more than just attention, it drew a thief in urban homesteader’s clothing. While being directly quoted is flattering as all hell, being stolen from is not. When your words are stolen by a member of the Dervaes Family and used as their own, it is even more flattering in a roundabout way. 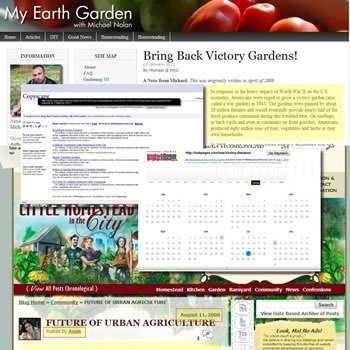 How is it that the family who are the self-proclaimed founders of the urban homestead movement couldn’t even find the original words to describe what they do? Under ordinary circumstances I might have chosen to contact the Dervaes Family and quietly attempt to settle the matter but given their penchant for threatening letters and frivolous trademark registrations as well as their reputation for being terribly difficult to deal with directly, I made the decision to bring this problem to the public so that everyone might see just what this family will do when they think no one is watching. 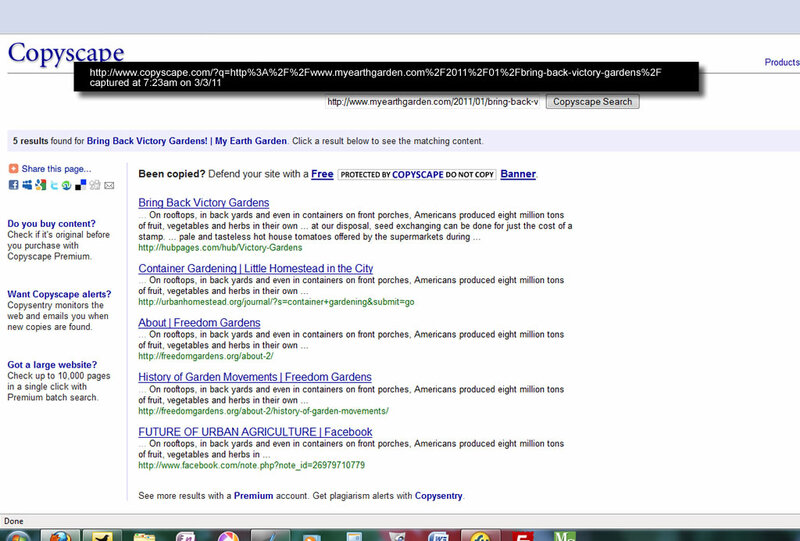 I was contacted this morning by a commenter to my article “Bring Back Victory Gardens” [see also: Exhibit A] originally posted to this site in April of 2008 and updated on January 25, 2011. The commenter informed me that parts of this article had been lifted verbatim and were being used by the Dervaes Family on their website. The commenter further provided me with a link to the page. NOTE: You can see the original comments on that piece were left in May of 2008 if you scroll to the bottom of the page. That information led me to visit Copyscape, a website that searches for plagiarism on the Internet. 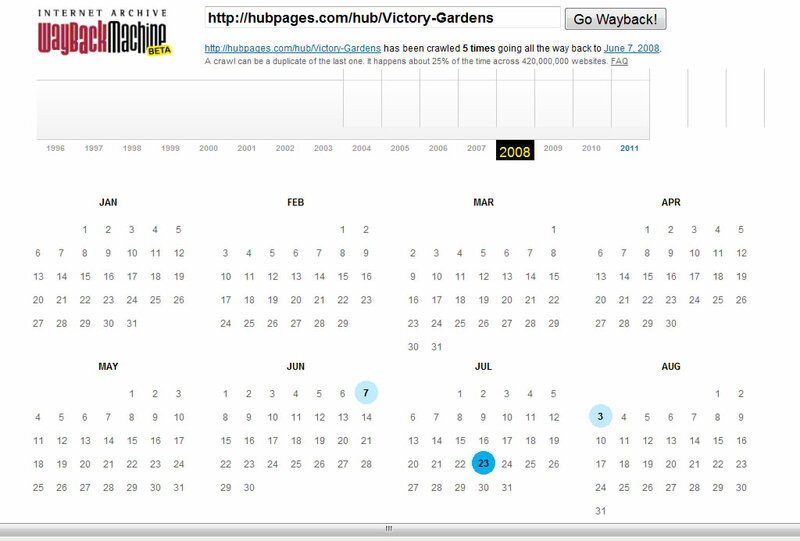 EXHIBIT B is a screen capture that shows what was revealed in that search. As you will see there are 5 pages that have directly copied my content. The first is the HubPages site that I mentioned earlier and is my property. The other four are penned/stolen by a member of the Dervaes Family. According to this link from the Internet Archive [see also: EXHIBIT C] my original article was posted online at some point in time prior to June 7, 2008 and was also screen capped by the Archive on July 23rd and August 3rd of that same year, both prior to this posting [see also: EXHIBIT D]made by Anais Dervaes on August 11, 2008, a full three months after the first Internet Archive capture. 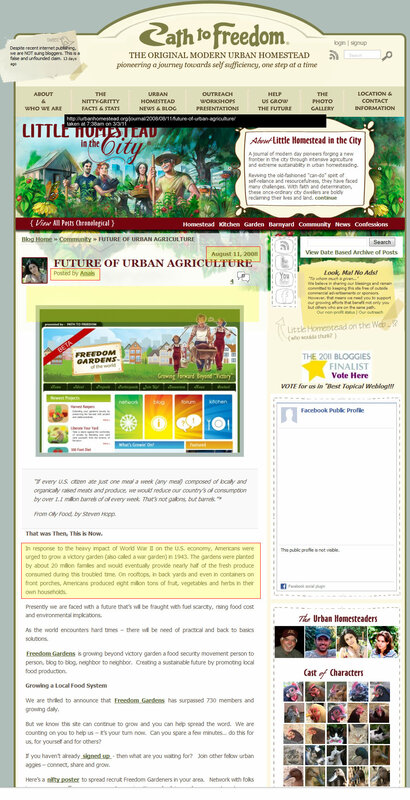 That blog post entitled “FUTURE OF URBAN AGRICULTURE” (in all caps) directly matches the name of the Facebook page from EXHIBIT B that is no longer available, leading me to believe that it was likely the Dervaes Family – and more specifically Anais Dervaes – who set up that Facebook page and added the stolen content there as well before taking the page down. This is the same family who insisted that Facebook take down established pages that used their trademarked phrase “urban homestead”. Funny, but I don’t see how they can not be aware of what they are doing. It just appears that they somehow believe themselves to be immune. Unfortunately, they are wrong. 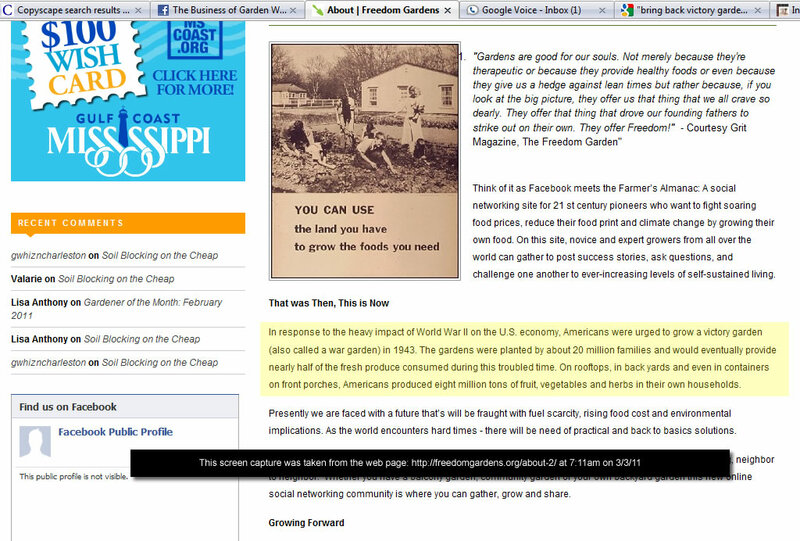 EXHIBIT E shows the main ABOUT page from the family’s Freedom Gardens (insert registered trademark thingie here) website. The same paragraph was lifted, again verbatim and without attribution. Still not convinced? What about EXHIBIT F, where they did it again? 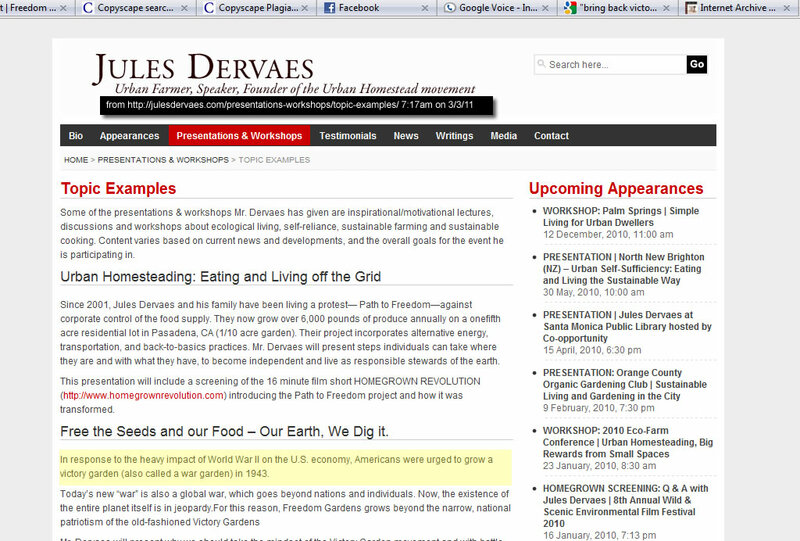 Finally, I leave you with the final screen cap, from the website of Dervaes Family Patriarch himself, Jules Dervaes. You would think that an “Urban Farmer, Speaker, Founder of the Urban Homestead Movement” would be able to come up with original content when describing the topics about which he is available to speak [see also: EXHIBIT G]. Sadly, he needed to use a sentence that I wrote instead of writing one himself. What Should I Get Out of This? Perhaps I should be getting some of these public speaking requests? Wonder if I should I be entitled to royalties from those speeches, or if I can add “Speech Writer for Jules Dervaes” to my resume? It seems as though I should be entitled to some restitution seeing as I am a writer by trade and they are using work that I penned and should thus receive remuneration for. Best I can tell, their family has been receiving the benefit of my services for 935 days and I have as yet received no payment for those services rendered. At my going rate for contract writing I should have been paid $250 for each use of my work. Because I did not receive payment for that work within my standard Net 30 time period, a late payment fee of 25% is assessed for each week the payment is late. That means my payment is, to date, 129 weeks late. Okay, so I’ve been watching too many court shows lately but I think my point has been made. I’m also pretty sure my math is off but what do you expect, I’m a writer. I’m no good at math, I’m good at words. So good that even the mighty Dervaes Family feels the need to steal them. In all seriousness, my work has been stolen and I feel that I should be paid for that. I have only placed this blog post on my public site to document the instances of theft adequately enough that I have legal grounds for further action should I deem them necessary. 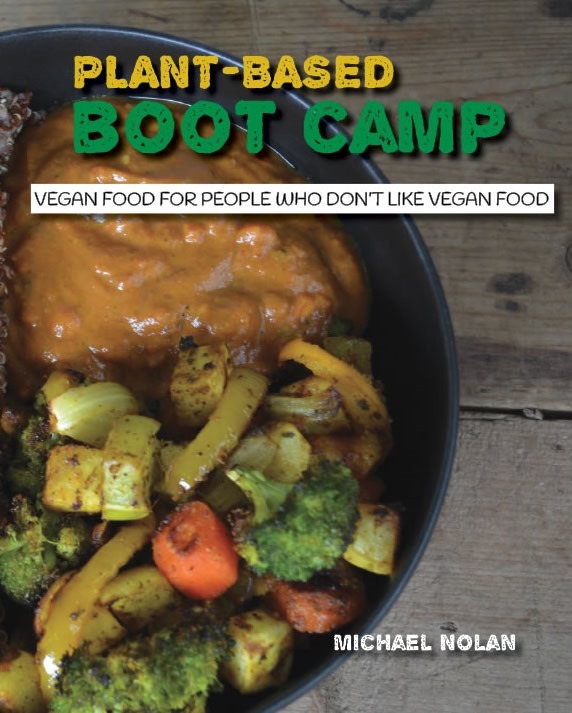 You have bullied the gardening and urban homesteading community long enough. I’m not bothering with a cease and desist letter because it is far more satisfying to expose you for the unoriginal frauds that you are and let the people decide who they want to believe. Thankfully I have been a part of this community long enough to know that its members are not the sheep you take them for and your time of pulling the wool over their eyes has come and gone.